Color-coded wiring in 25' to 40' lengths with quick connects fittings, meets federal standards for heat, pull and insulation, making installation easy. They are custom designed for Insta-Trim Boat Leveler Co., epoxy sealed and humidity resistant, thereby preventing shorting out. The solenoids lock the tabs in any position, eliminating driftback. Barb type hose fittings provide tight, secure connections. A powerhouse with coated wirings and a thermal overload that resists temperature and amperage build-up. 1 3/4" stack windings and top mounting eliminated oil leakage. The motor is mounted with stainless steel nuts and bolts, and is easily disassembled. 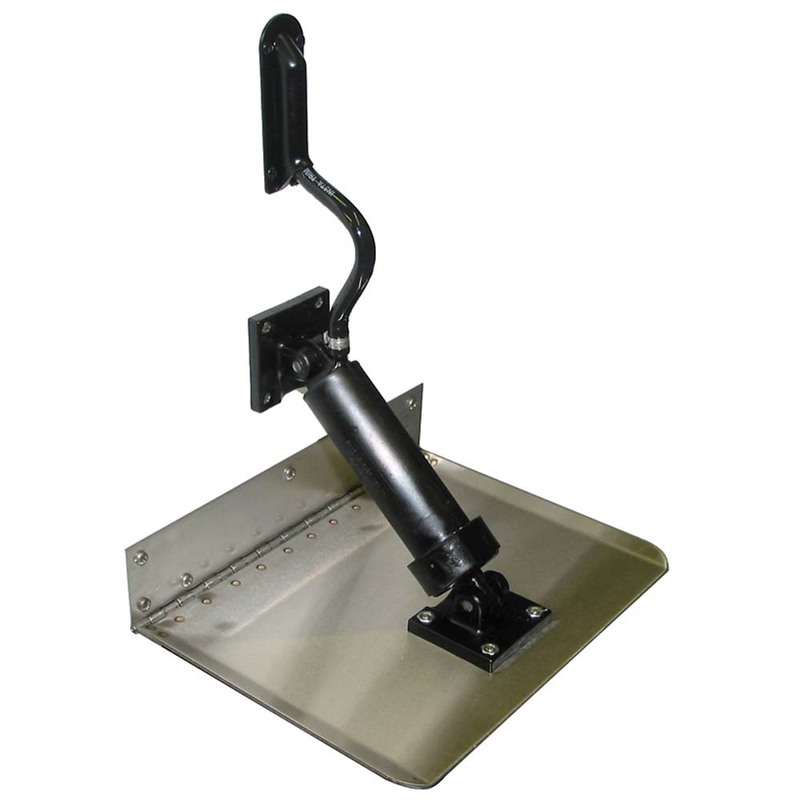 Swivel type brackets allow cylinders to be mounted an adjusted to any angle. Knockout pins act as shear pins it tab strikes an object. Designed and engineered exclusively by Instatrim. The built-in bypass is factory set at 400 P.S.I. tolerance held to .00025. Amperage doesn't exceed 16 because the unit circulates oil, rather than stalling out or trying to pump additional pressure. 4 1/2" D x 6" W x 11"H, high impact ABS plastic cover with a built-in oil reservoir mounts easily with two screws. The filler is located in front. Our cover protects the motor from occasional wash down. A stainless steel spring retracts the cylinder when the boat is not in motion. 12 gauge 304 stainless steel trim tabs are available in standard and custom lengths. They are guaranteed against electrolysis, remaining strong and secure. Insta-Trim's hinges prevent most spray and can be used for transom or bottom mounting. Designed and manufactured exclusively for Insta-Trim with nylon-reinforced webbing and protective PVC coating. Rated at 2000 lb. burst pressure, 15' of hose is supplied for your system. Entering the transom 6" above the water line, the hoses are held securely with hose trim. Stainless steel clamps hold the hose to barb fitting at the solenoid. Mounted on the dash they are easy to operate. 2TP Micro switch with silver contact points adjust the tabs for maximum control and performance. One pint of Insta-Trim biodegradable transmission oil, funnel and mounting hardware is supplied.